First, because you had to ask (or at least I had to ask myself), is it "duck" or "duct" tape. The answer might surprise you, so a little history. During World War II, the American armed forces needed a strong, waterproof tape to keep moisture out of ammunition cases. Because it was waterproof, everyone referred to it as "duck" tape. This versatile tape was used as a mending material that could be ripped by hand and used to make quick repairs to jeeps, aircraft, and other military equipment. Johnson and Johnson Company which had by then developed its own line of adhesive tapes, helped the war effort by combining cloth mesh (which rips easily) with a rubber-based adhesive, and then gave that combination of rubberized, waterproof coating. Following the war, housing in the United States boomed, and many new homes featured forced-air heating and air-conditioning units that relied on duct work to distribute warmth and coolness. Johnson and Johnson's strong military tape made the perfect material for binding and repairing the duct work. By changing the color of the tape's rubberized top coat from Army green to sheet metal gray, "duct" tape was born. In summary, first it was "duck", but then it was "duct", but we'll use "duct" just because. Along with a multitude of other items on your Prepper Checklists, you must have an ample supply of duct tape both at home and in your Bug Out bag. All you need to do is google “Duct Tape” and you will soon realize how important this sticky substance can be to your long term survival. We put together a list of several survival uses of duct tape for preppers to help people get excited about this versatile tool. Repair a tent: You open your tent at the campsite and oops — a little tear. No problem as long as you’ve brought your duct tape along. Cover the hole with a patch; for double protection mirror the patch inside the tent. You’ll keep insects and weather where they belong. Make a clothesline: Twisting a long piece of Duct tape makes a great piece of rope to use as a clothesline. Repair your sleeping bag, or down jacket: If you have a hole in your down sleeping bag or down jacket, you can patch the hole with duct tape. No more feathers flying out all over the place. Reseal packages of food: Use duct tape to seal up partially opened packages of food. Fold over the top of the package and seal it tight with a piece of duct tape. Works for cans, too. Simply fashion a lid out of duct tape. Wrap Your Pandemic Suit: Use Duct Tape to wrap your hands and feet when addressing a pandemic or bioterror situation. Hold your tent closed: A damaged zipper could leave your tent door flapping in the wind. Stick the door shut, and keep the bugs and critters out. Splint a broken tent pole or fishing pole: Tape a stick to the broken area of your tent pole or fishing rod, and you might just get one last adventure out of it. Catch insects: Roll off a few foot-long strips of duct tape and hang them from a branch or your tent or cabin rafters. The DT serves as flypaper and when you depart, you can roll up the tape to toss it in the trash. No need to use nasty chemicals, either. Repair your water bottle: Have a cracked water bottle or a pierced hydration bladder? A little strip of duct tape to the rescue. Be sure to dry the surface before you try to tape your patch in place since most forms of duct tape don’t stick to wet surfaces. You can also wrap plastic water bottles with duct tape to prevent cracking and leaking. Make a spear: Strap your knife to a pole and you have a trusty spear to fend off beasts, or make one into your dinner. Create a shelter: With some trash bags and some duct tape, and you have a survival shelter roof, or sleeping bag cover, a wind break, or well, there are kits of possibilities. Wrap a sprained ankle: If you trip and sprain your ankle, wrap the ankle with duct tape to give it some support. Make butterfly bandage strips: Cut two small strips of DT, and add a smaller strip across their centers (sticky side to sticky side) to create a makeshift butterfly suture. Make a sling: Fold a length of DT down the middle, so that it is half the original width and no longer exposing a sticky side. Use the strap to make a sling for a busted arm. Affix bandages: Place a sterile dressing over your wound, and strap it in place with DT. Blister care: Cover the blistered area with a bit of cotton gauze, and tape over the cotton. Make sure that the duct tape fully covers the cotton and doesn’t touch the blister at all. Create a splint: A broken ankle or leg can be stabilized with ample splint material, padding and duct tape. Pad the crotch of a forked branch with some cloth and duct tape to fashion a quick crutch to go with your splint. Make a bandage: Fold tissue paper or paper towel to cover the wound and cover this with duct tape. Make a temporary roof shingle: If you have lost a wooden roof shingle, make a temporary replacement by wrapping duct tape in strips across a piece of 1/4-inch (6-millimeter) plywood you’ve cut to size. Wedge the makeshift shingle in place to fill the space. It will close the gap and repel water until you can repair the roof. Fix a hole in your siding: Has the stormy weather damaged your vinyl siding? A broken tree limb tossed by the storm, hailstones, or even an errant baseball can rip your siding. Patch tears in vinyl siding with duct tape. Choose tape in a color that matches your siding and apply it when the surface is dry. Smooth your repair by hand or with a rolling pin. The patch should last at least a season or two. Tape a broken window: Before removing broken window glass, crisscross the broken pane with duct tape to hold it all together. This will ensure a shard does not fall out and cut you. Mend a screen: Have the bugs found the tear in your window or door screen? Thwart their entrance until you make a permanent fix by covering the hole with duct tape. Repair a trash can: Plastic trash cans that are blown over by a storm or frozen in an ice storm often split or crack along the sides. Repair the tear with duct tape. Just be sure tape over the crack both outside and inside the can. Make a belt: Run a piece of DT through your belt loops and stick it to itself in the front. Overlap it about 4 or 5 inches and you’ll still be able to peel the belt apart when nature calls. Repair your glasses: If your glasses break while you are out in the wilderness, tape them up. You might look a bit nerdy but at least you will be able to see. Fix your rain gear: Keep the dry stuff dry, and keep the water out, by mending your ripped rain gear with a few strips of duct tape. Repair your clothing: Repair rips and tears in your clothing by slipping a piece of tape inside the rip, sticky side out, and carefully pressing both sides of the rip together. The repair will be barely detectable. 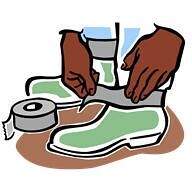 Add extra insulation in your boots: Make your winter boots a little bit warmer by taping the insoles with duct tape, silver side up. The shiny tape will reflect the warmth of your feet back into your boots. Hem your pants: No time to hem your new jeans? Fake it with a strip of duct tape. The new hem will last through a few washes too. Make handcuffs: Create handcuffs for the bad guys by taping their hands together around a tree to prevent them from becoming a danger to themselves or others. Mark a trail: Use duct tape to blaze a trail or signal for rescue, especially if your DT is brightly colored or reflective. 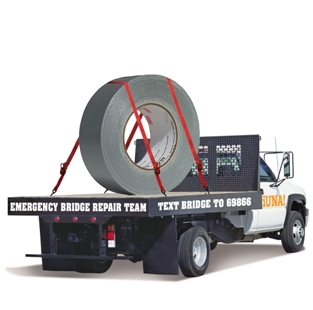 Make emergency repairs on your Bug Out Vehicle: Repair leaking hoses, broken tail lights, windows that don’t stay and even bullet holes with strips of duct tape. Hang perimeter or security lights: String lights around your camp with a rope make of duct tape. Since WWII duct tape has been considered somewhat of a miracle worker. 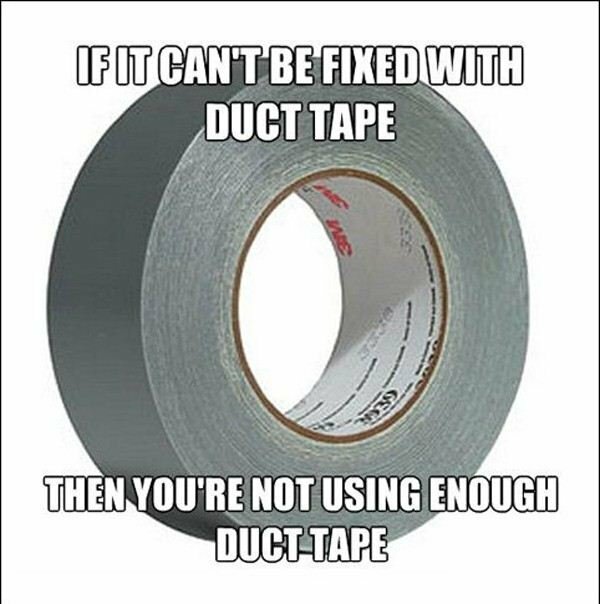 For the fix-it-yourself types, duct tape has become indispensable and has been used for things that I am sure the original developers of the stuff never imagined. But for Preppers, duct tape is an essential item on everyone's list.